Chromey and Me on Roadtrip to San Antonio! Day we got the Fatboy! Well where do I start. This is my Chromey. 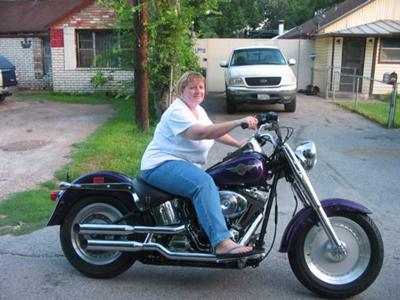 She is a 2005 HD Fatboy, Concord Grape with an all stock motor and lot's of Chrome. She got all of her chrome because instead of jewelry for gifts from the Hubby on special occasions he gave me a piece or 2 of chrome for my Chromey. Actually that is how she got her name. We both love the bling, bling on her and not me. 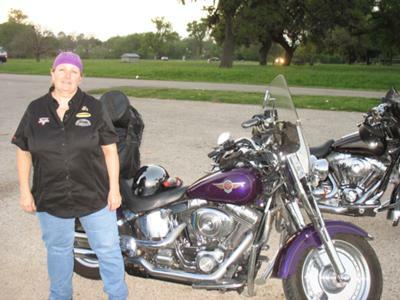 In this picture she has her sissybar, t-bag and saddlebags on because we were on a roadtrip to/from San Antonio (had to have somewhere to carry our stuff). Most of the time Chromey doesn't have her windshield, bags, or sissybar on and she even looks better. She is great to ride and takes care of me and my Wind Therapy! Comments for Chromey and Me! Thanks, I love the purple also. I must because my roadking is the same color. lol Chromey is just my favorite of the 2 bikes. Thanks again! Beautiful bike - enjoy the ride!! A beautiful bike. I love the fact that you call it wind therapy, so true.